Jam is sweet. It’s meant to be sweet; the sugar used preserves the fruit and makes the jam last for longer. In my house that could mean up to a year; providing I use a sterilised jar, and store it in a cool, dark place. What if there was a way to make low sugar jam? You’d still have a “set” consistency, but the trade-off would be that you’d have to make smaller quantities because the jam wouldn’t last so long. I’ve tested plenty of jam recipes over the years. I’ve made jam with less sugar than recommended, replaced the refined sugar with fruit sugar (fructose), used honey, and used alternative sweeteners like aspartame and xylitol. 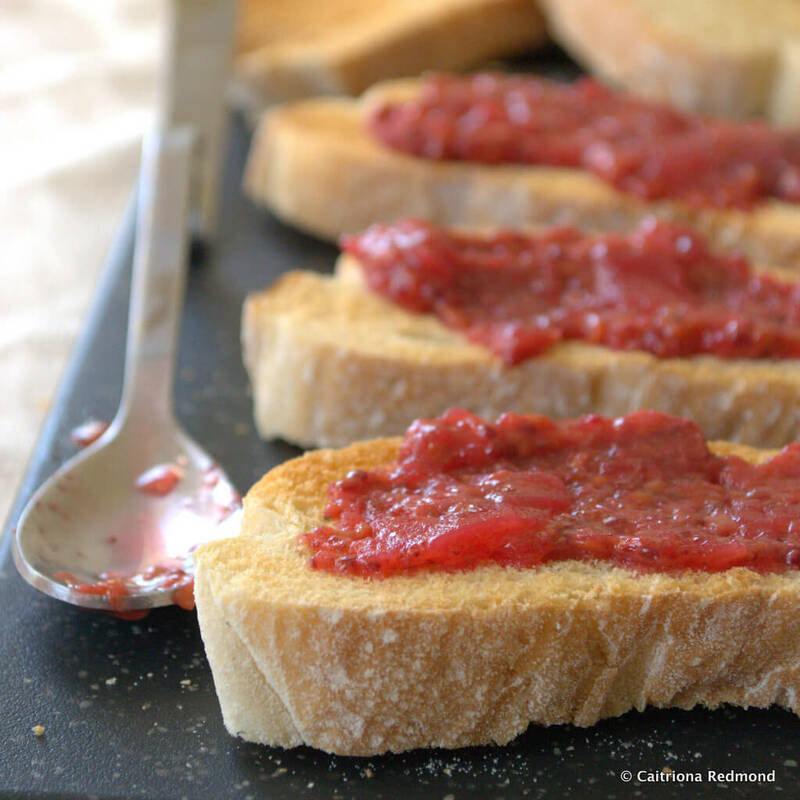 Typical jam recipes are made on a 50:50 ratio of fruit to sugar. This recipe turns all that wisdom around and uses far less than that. I was inspired to create this recipe after spending a wonderful afternoon recently at the Boyne Grove Farm. I came home with a few bottles of crisp Dan Kelly’s Cider, brilliant cider vinegar, simply the best pressed apple juice I’ve had in a long time, and a tray of their own apples to cook with. The jam consistency is provided by using some milled chia seeds which were easier to get hold of than I expected. Believe it or not I found them in Aldi at a reasonable price. I pop a large spoon of this low sugar jam into my porridge in the morning. You could try it with natural yoghurt, with a crumble topping, or just spread on crisp toast the way my kids love it. Preheat a (fan) oven to 130 degrees Celsius. Put 2 clean standard jam jars, remove the lids and put beside the jars (they hold approximately 400-454g weight) onto a sturdy baking tray and place into the oven. Take a large, heavy bottomed saucepan, fill with raspberries, and place on a medium heat. Peel, core, then roughly chop the apple. Discard the peelings and core, then add the chopped apple to the raspberries. Pour the sugar into the saucepan and stir until it coats the fruit. Allow the contents of the saucepan to come to the boil. Skim off any foam/scum that might appear. Once the fruit/sugar mixture starts to boil, sprinkle in the milled chia seeds and stir well. Allow to boil for a further 2-3 minutes. Turn off the heat on the saucepan. 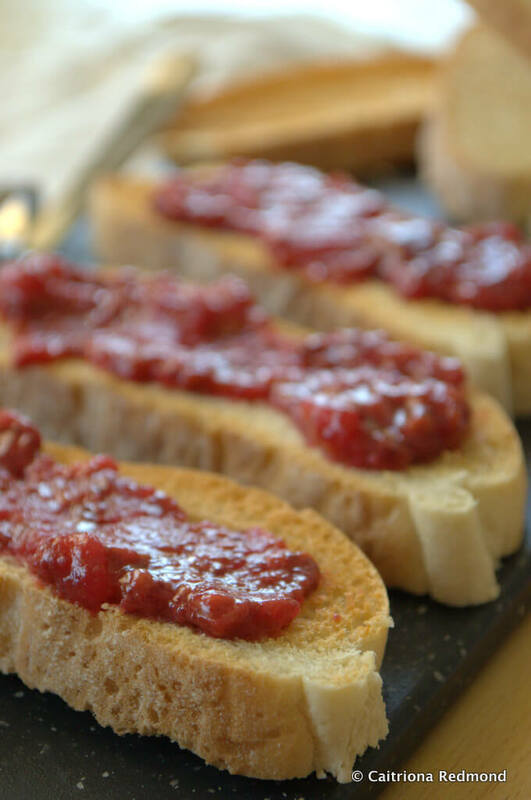 Carefully remove the tray of jars from the oven and spoon the jam mixture into the jars. Leave the jars to cool slightly before covering with their lids. This jam will keep for up to 3 weeks in the fridge, if it lasts that long! The chia seeds were purchased in Aldi, however you can get them in health stores nationwide. Using the milled seeds means that the jam has a smoother consistency, if you have a food processor you can blitz up what you need, or use a mortar and pestle instead. Fresh raspberries are always nicer but they’re expensive in shops at the moment. Frozen raspberries work just fine in this recipe and as they are boiled, you don’t need to worry about the pesky health warning if you buy imported frozen fruit. The sugar used here is regular granulated sugar. By milled , do you mean spun around the blender and turned into powder? Sort of. Ground finer than whole – not flour consistency. More coarse. Does that help? Wow, this really looks delicious. I love to create my own jam, so I am always looking for new recipes. I definitely have to try your low sugar jam myself. Thank you so much for sharing the recipe!